Vasculitis is defined as inflammation of blood vessels. It may result in vessel wall thickening, stenosis, and occlusion with subsequent ischemia. Necrotizing inflammation can completely destroy segments of the wall. 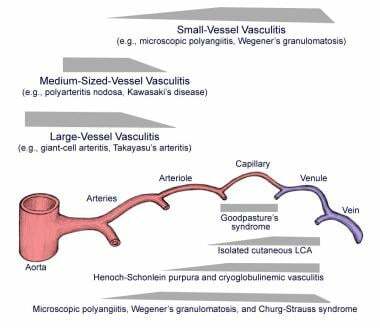 Vasculitis can involve vessels of any size and can affect any organ system. The clinical presentation varies according to the histologic type of inflammation, the size of the involved blood vessel segment, and the distribution of the involved vessels. Many subtypes of vasculitis are recognized. This article focuses on the primary systemic vasculitides of childhood. The most common forms of systemic vasculitis in children are Henoch-Schonlein purpura (HSP) and Kawasaki disease (KD). Other subtypes of primary childhood vasculitis are much rarer. Vasculitis can also occur secondary to another disease, and this should be ruled out. Diseases associated with secondary vasculitis include infection, malignancy, collagen vascular disease (eg, systemic lupus erythematosus, dermatomyositis), and drug hypersensitivity. See Differentials. The image below depicts nodules in cutaneous polyarteritis nodosa (PAN), a systemic vasculitis characterized by necrotizing inflammatory lesions that affect medium-sized and small muscular arteries. Nodules on sole of foot in cutaneous polyarteritis nodosa (PAN). Practitioners may find it helpful to think of primary systemic vasculitides based on the predominant size of the involved vessels, as suggested by the Chapel Hill Classification. [1, 2] See the image below. Preferred sites of vascular involvement by selected vasculitides. However, an overlap of vessel sizes affected within the diseases is noted, and the phenotype and pattern of organ involvement in vasculitis seems to be independent of vessel size. For example, Kawasaki disease is characterized by a mucocutaneous syndrome and coronary artery inflammation, whereas polyarteritis nodosa (PAN), another medium-vessel vasculitis, manifests with nodular skin lesions, neuropathy, and hypertension. As such, the most recent classification of childhood vasculitides incorporates both vessel size and organ manifestations. This classification was proposed at a consensus conference in 2005 and was endorsed by Paediatric Rheumatology European Society (PRES) and the European League against Rheumatism (EULAR). These criteria represent a modification and adaptation of existing American College of Rheumatology and Chapel Hill criteria for vasculitis in adults. The predominantly large vessel vasculitis is Takayasu arteritis. The most common childhood medium-vessel vasculitis is Kawasaki disease. It is a necrotizing vasculitis that has a predilection for the coronary arteries. Classic features include prolonged fever, mucocutaneous changes and lymphadenopathy. Other manifestations may include irritability, arthritis, and abdominal pain. Childhood polyarteritis nodosa is a necrotizing vasculitis of medium-sized arteries and is recognized in distinct systemic and cutaneous forms. Systemic polyarteritis nodosa involves all organ systems and the presentation widely varies. Features include vasculitic skin lesions, hypertension, neuropathy, and myalgia. Note that renal involvement does not manifest as glomerulonephritis, as occurs with small-vessel disease. Unlike in adults, angiographic or biopsy evidence of vasculitis is required to make this diagnosis. Childhood PACNS is defined by clinical evidence of a newly-acquired focal or diffuse neurologic deficit plus angiographic or histologic evidence of CNS vasculitis, in the absence of a systemic condition associated with these findings. Two clinically and radiologically distinct types of childhood PACNS are noted: large-medium vessel (angiography-positive) and small vessel (angiography-negative). These have different clinical presentations (see Primary CNS Vasculitis of Childhood). Henoch-Schönlein purpura is the most common vasculitis in children, and is associated with immunoglobulin A (IgA) immune deposition in small vessels. Presenting features include palpable purpura, abdominal pain (which may be associated with GI hemorrhage and/or intussusception), arthritis, and evidence of glomerulonephritis (hematuria, proteinuria). Microscopic polyangiitis (MPA) is a necrotizing vasculitis associated with glomerulonephritis and pulmonary capillaritis. Presenting features include purpuric rash, proteinuria and/or hematuria, hemoptysis, CNS involvement, and arthralgias. MPA is associated with ANCA, most commonly with a perinuclear pattern (p-ANCA) and antibodies against myeloperoxidase (anti-MPO). Churg-Strauss syndrome (CSS) is an eosinophilic granulomatous vasculitis characterized predominantly by pulmonary involvement. Patients typically have a previous history of asthma, allergic rhinitis, and/or sinusitis. A characteristic feature is the finding of nonfixed pulmonary infiltrates. Eosinophilic infiltration results in multiorgan involvement, including neuropathy and cardiovascular disease (pericarditis). ANCA positivity is seen in approximately 40% of patients, usually with an “atypical” or “indeterminate” pattern. Isolated cutaneous leukocytoclastic vasculitis can be either primary (rarely) or secondary to various medications, infections, or collagen vascular disease. Hypocomplementemic urticarial vasculitis is a cutaneous vasculitis that may result from primary hypocomplementemia or as part of a disease associated with low complement levels (eg, systemic lupus erythematosus). Behcet disease involves vessels of all sizes. The diagnosis is made clinically in patients with recurrent oral ulcers who also have recurrent genital ulcers, uveitis, various skin lesions, and/or a positive pathergy test. Anti-GBM antibody disease/Goodpasture syndrome is a type of vasculitis caused by deposition of anti-GBM antibodies in small vessels of lungs and kidneys. Goodpasture syndrome clinically manifests with rapidly progressive glomerulonephritis and/or pulmonary hemorrhage (pulmonary renal syndrome). Vessel inflammation occurs by various mechanisms in this heterogenous group of diseases. The histopathological pattern of inflammation is a characteristic feature of the vasculitis subtypes. In anti-GBM antibody disease, circulating antibodies bind to type IV collagen within the glomerular basement membrane. Immunofluorescence study of renal biopsies demonstrates linear deposition of IgG along the glomerular basement membrane. Pulmonary hemorrhage occurs when these antibodies have access to the alveolar basement membrane. The other vasculitides are quite rare in childhood. In Kawasaki disease, acute mortality is 0.12% (mainly cardiac-related deaths). With appropriate treatment, the rate of coronary aneurysm development is approximately 2-4%. Henoch-Schönlein purpura is usually a self-limited condition. The long-term prognosis relies mainly on the severity of renal involvement. The overall risk of end-stage renal disease is 1-3%, but this risk can increase to 20% if the patient presents with significant nephritis or nephrotic syndrome. In adults with Henoch-Schönlein purpura, a higher rate of renal impairment is noted, and the 5-year survival rate is only approximately 75%. Takaysu arteritis is associated with a 10-year survival rate of approximately 87%. Polyarteritis nodosa and Churg-Strauss syndrome are associated with a 5-year survival rate of 75-80%. Microscopic polyangiitis is associated with a 5 year survival rate of 45-75%. Granulomatosis with polyangiitis (formerly Wegener granulomatosis) is associated with significant morbidity and mortality. Approximately 11% of patients require mechanical ventilation and/or require dialysis. Survival is approximately 75% at 5 years in adults; survival data are not reported in pediatric patients. The vasculitides are seen in patients of all races and ethnicities but some notable patterns of distribution are noted. Henoch-Schönlein purpura has a male-to-female ratio of 2:1. Kawasaki disease has a male-to-female ratio of 1.6:1. Polyarteritis nodosa has a slight male preponderance. Takayasu arteritis has a strong female preponderance. Henoch-Schönlein purpura has a peak age of onset at 3-10 years; 75% of patients are younger than 10 years. Polyarteritis nodosa has a peak age of onset at 9-11 years. Takayasu arteritis most commonly presents in the second and third decades of life; 20% are younger than 20 years. Duarte MM, Geraldes R, Sousa R, Alarcao J, Costa J. Stroke and Transient Ischemic Attack in Takayasu's Arteritis: A Systematic Review and Meta-analysis. J Stroke Cerebrovasc Dis. 2016 Apr. 25 (4):781-91. [Medline]. Ozen S, Ruperto N, Dillon MJ, et al. EULAR/PReS endorsed consensus criteria for the classification of childhood vasculitides. Ann Rheum Dis. 2006 Jul. 65(7):936-41. [Medline]. [Full Text]. Ozen S, Anton J, Arisoy N, et al. Juvenile polyarteritis: results of a multicenter survey of 110 children. J Pediatr. 2004 Oct. 145(4):517-22. [Medline]. Akikusa JD, Schneider R, Harvey EA, et al. Clinical features and outcome of pediatric Wegener's granulomatosis. Arthritis Rheum. 2007 Jun 15. 57(5):837-44. [Medline]. Peco-Antic A, Bonaci-Nikolic B, Basta-Jovanovic G, et al. Childhood microscopic polyangiitis associated with MPO-ANCA. Pediatr Nephrol. 2006 Jan. 21(1):46-53. [Medline]. Boyer D, Vargas SO, Slattery D, Rivera-Sanchez YM, Colin AA. Churg-Strauss syndrome in children: a clinical and pathologic review. Pediatrics. 2006 Sep. 118(3):e914-20. [Medline]. Sarica-Kucukoglu R, Akdag-Kose A, KayabalI M, et al. Vascular involvement in Behçet's disease: a retrospective analysis of 2319 cases. Int J Dermatol. 2006 Aug. 45(8):919-21. [Medline]. Weyand CM, Goronzy JJ. Medium- and large-vessel vasculitis. N Engl J Med. 2003 Jul 10. 349(2):160-9. [Medline]. Dedeoglu F, Sundel RP. Vasculitis in children. Rheum Dis Clin North Am. 2007 Aug. 33(3):555-83. [Medline]. Jennette JC, Falk RJ. New insight into the pathogenesis of vasculitis associated with antineutrophil cytoplasmic autoantibodies. Curr Opin Rheumatol. 2008 Jan. 20(1):55-60. [Medline]. Xiao H, Heeringa P, Hu P, et al. Antineutrophil cytoplasmic autoantibodies specific for myeloperoxidase cause glomerulonephritis and vasculitis in mice. J Clin Invest. 2002 Oct. 110(7):955-63. [Medline]. [Full Text]. Md Yusof MY, Vital EM, Das S, Dass S, Arumugakani G, Savic S, et al. Repeat cycles of rituximab on clinical relapse in ANCA-associated vasculitis: identifying B cell biomarkers for relapse to guide retreatment decisions. Ann Rheum Dis. 2015 Apr 8. [Medline]. Janeczko LL. Naive B-Lymphopenia Possible Biomarker of Disease Activity in Vasculitis. http://www.medscape.com/viewarticle/843633. Available at http://www.medscape.com/viewarticle/843633. April 24, 2015; Accessed: July 1, 2015. Lau KK, Wyatt RJ, Moldoveanu Z, et al. Serum levels of galactose-deficient IgA in children with IgA nephropathy and Henoch-Schönlein purpura. Pediatr Nephrol. 2007 Dec. 22(12):2067-72. [Medline]. Gardner-Medwin JM, Dolezalova P, Cummins C, Southwood TR. Incidence of Henoch-Schönlein purpura, Kawasaki disease, and rare vasculitides in children of different ethnic origins. Lancet. 2002 Oct 19. 360(9341):1197-202. [Medline]. Wu M-H, Nakamura Y, Burns JC, et al. State-of-the-art basic and clinical science of Kawasaki disease. Pediatric Health. 2008. 2:405-409. Cabral DA, Uribe AG, Benseler S, et al. Classification, presentation, and initial treatment of Wegener's granulomatosis in childhood. Arthritis Rheum. 2009 Nov. 60(11):3413-24. [Medline]. Phillip R, Luqmani R. Mortality in systemic vasculitis: a systematic review. Clin Exp Rheumatol. 2008 Sep-Oct. 26(5 Suppl 51):S94-104. [Medline]. Narchi H. Risk of long term renal impairment and duration of follow up recommended for Henoch-Schonlein purpura with normal or minimal urinary findings: a systematic review. Arch Dis Child. 2005 Sep. 90(9):916-20. [Medline]. [Full Text]. Elbers J, Benseler SM. Central nervous system vasculitis in children. Curr Opin Rheumatol. 2008 Jan. 20(1):47-54. [Medline]. Da Dalt L, Zerbinati C, Strafella MS, et al. Henoch-Schönlein purpura and drug and vaccine use in childhood: a case-control study. Ital J Pediatr. 2016 Jun 18. 42 (1):60. [Medline]. [Full Text]. Reiff A. Ocular complications of childhood rheumatic diseases: nonuveitic inflammatory eye diseases. Curr Rheumatol Rep. 2009 Jul. 11(3):226-32. [Medline]. Avcin T, Cimaz R, Rozman B. The Ped-APS Registry: the antiphospholipid syndrome in childhood. Lupus. 2009 Sep. 18(10):894-9. [Medline]. Levine D, Akikusa J, Manson D, Silverman E, Schneider R. Chest CT findings in pediatric Wegener's granulomatosis. Pediatr Radiol. 2007 Jan. 37(1):57-62. [Medline]. Kim YK, Lee KS, Chung MP, et al. Pulmonary involvement in Churg-Strauss syndrome: an analysis of CT, clinical, and pathologic findings. Eur Radiol. 2007 Dec. 17(12):3157-65. [Medline]. Lauque D, Cadranel J, Lazor R, et al. Microscopic polyangiitis with alveolar hemorrhage. A study of 29 cases and review of the literature. Groupe d'Etudes et de Recherche sur les Maladies "Orphelines" Pulmonaires (GERM"O"P). Medicine (Baltimore). 2000 Jul. 79(4):222-33. [Medline]. Dejaco C, Ramiro S, Duftner C, Besson FL, Bley TA, Blockmans D, et al. EULAR recommendations for the use of imaging in large vessel vasculitis in clinical practice. Ann Rheum Dis. 2018 May. 77 (5):636-643. [Medline]. Kelly JC. First EULAR Guidance on Imaging in Large Vessel Vasculitis. Medscape Medical News. Available at https://www.medscape.com/viewarticle/892145#vp_2. February 1, 2018; Accessed: December 10, 2018. Durongpisitkul K, Gururaj VJ, Park JM, Martin CF. The prevention of coronary artery aneurysm in Kawasaki disease: a meta-analysis on the efficacy of aspirin and immunoglobulin treatment. Pediatrics. 1995 Dec. 96(6):1057-61. [Medline]. Weiss PF, Feinstein JA, Luan X, Burnham JM, Feudtner C. Effects of corticosteroid on Henoch-Schönlein purpura: a systematic review. Pediatrics. 2007 Nov. 120(5):1079-87. [Medline]. Chartapisak W, Opastirakul S, Hodson EM, Willis NS, Craig JC. Interventions for preventing and treating kidney disease in Henoch-Schönlein Purpura (HSP). Cochrane Database Syst Rev. 2009 Jul 8. CD005128. [Medline]. Levy-Clarke G, Jabs DA, Read RW, Rosenbaum JT, Vitale A, Van Gelder RN. Expert panel recommendations for the use of anti-tumor necrosis factor biologic agents in patients with ocular inflammatory disorders. Ophthalmology. 2014 Mar. 121(3):785-96.e3. [Medline]. Mukhtyar C, Guillevin L, Cid MC, et al. EULAR recommendations for the management of primary small and medium vessel vasculitis. Ann Rheum Dis. 2009 Mar. 68(3):310-7. [Medline]. [Guideline] Mukhtyar C, Guillevin L, Cid MC, et al. EULAR recommendations for the management of large vessel vasculitis. Ann Rheum Dis. 2009 Mar. 68(3):318-23. [Medline]. Guerry MJ, Brogan P, Bruce IN, D'Cruz DP, Harper L, Luqmani R. Recommendations for the use of rituximab in anti-neutrophil cytoplasm antibody-associated vasculitis. Rheumatology (Oxford). 2012 Apr. 51(4):634-43. [Medline]. Stone JH, Merkel PA, Spiera R, Seo P, Langford CA, Hoffman GS. Rituximab versus cyclophosphamide for ANCA-associated vasculitis. N Engl J Med. 2010 Jul 15. 363(3):221-32. [Medline]. Jones RB, Tervaert JW, Hauser T, Luqmani R, Morgan MD, Peh CA. Rituximab versus cyclophosphamide in ANCA-associated renal vasculitis. N Engl J Med. 2010 Jul 15. 363(3):211-20. [Medline]. Holle JU, Dubrau C, Herlyn K, Heller M, Ambrosch P, Noelle B. Rituximab for refractory granulomatosis with polyangiitis (Wegener's granulomatosis): comparison of efficacy in granulomatous versus vasculitic manifestations. Ann Rheum Dis. 2012 Mar. 71(3):327-33. [Medline]. van Daalen EE, Rizzo R, Kronbichler A, Wolterbeek R, Bruijn JA, Jayne DR, et al. Effect of rituximab on malignancy risk in patients with ANCA-associated vasculitis. Ann Rheum Dis. 2017 Jun. 76 (6):1064-1069. [Medline]. Faurschou M, Westman K, Rasmussen N, de Groot K, Flossmann O, Höglund P, et al. Long-term outcome of a clinical trial comparing methotrexate to cyclophosphamide for remission induction of early systemic ANCA-associated vasculitis. Arthritis Rheum. 2012 May 21. [Medline]. Roubaud-Baudron C, Pagnoux C, Méaux-Ruault N, Grasland A, Zoulim A, LE Guen J. Rituximab maintenance therapy for granulomatosis with polyangiitis and microscopic polyangiitis. J Rheumatol. 2012 Jan. 39(1):125-30. [Medline]. Filocamo G, Buoncompagni A, Viola S, Loy A, Malattia C, Ravelli A, et al. Treatment of Takayasu's arteritis with tumor necrosis factor antagonists. J Pediatr. 2008 Sep. 153(3):432-4. [Medline]. Ruiz-Irastorza G, Hunt BJ, Khamashta MA. A systematic review of secondary thromboprophylaxis in patients with antiphospholipid antibodies. Arthritis Rheum. 2007 Dec 15. 57(8):1487-95. [Medline]. Lee BB, Laredo J, Neville R, Villavicencio JL. Endovascular management of takayasu arteritis: is it a durable option?. Vascular. 2009 May-Jun. 17(3):138-46. [Medline]. Roediger FC, Orloff LA, Courey MS. Adult subglottic stenosis: management with laser incisions and mitomycin-C. Laryngoscope. 2008 Sep. 118(9):1542-6. [Medline]. McCrindle BW. Kawasaki disease: a childhood disease with important consequences into adulthood. Circulation. 2009 Jul 7. 120(1):6-8. [Medline]. Newburger JW, Takahashi M, Gerber MA, et al. Diagnosis, treatment, and long-term management of Kawasaki disease: a statement for health professionals from the Committee on Rheumatic Fever, Endocarditis and Kawasaki Disease, Council on Cardiovascular Disease in the Young, American Heart Association. Circulation. 2004 Oct 26. 110(17):2747-71. [Medline]. Holve TJ, Patel A, Chau Q, Marks AR, Meadows A, Zaroff JG. Long-term cardiovascular outcomes in survivors of Kawasaki disease. Pediatrics. 2014 Feb. 133(2):e305-11. [Medline]. Patient with Wegener granulomatosis and saddle-nose deformity. Tender erythematous nodules in cutaneous polyarteritis nodosa (PAN). Necrotic lesions of polyarteritis nodosa (PAN). Chest radiography in Churg-Strauss syndrome (CSS) with pulmonary infiltrates. CT of sinuses in a patient with Wegener granulomatosis (WG) showing erosion and loss of sinus walls. CT chest in a patient with Churg-Strauss syndrome (CSS) showing multiple nodules. The authors and editors of Medscape Reference gratefully acknowledge the contributions of previous author, Christine Hom, MD, to the development and writing of this article.